These pearls and sample scenarios will enhance your knowledge. This article highlights appropriate use of modifiers -58, -78, and -79. Modifiers can financially make or break a practice. Misuse of modifiers is listed by payers as one of the top five reasons for claim denial; often no modifier is appended when one is needed, or the wrong modifier is chosen. Modifiers are often confusing, especially surgical modifiers. Test your modifier mastery by determining the correct claim submissions for the case studies below. Will it be modifier -58, -78, or -79? Answers are listed at the end of the article. ARE YOU A MODIFIER MASTER? A patient presents during the postoperative period of a vitrectomy in the left eye (OS). Examination reveals the need for an intravitreal injection, which is then performed. A patient undergoes complex repair of a retinal detachment (RD) (CPT code 67113 -RT). She returns to the OR 6 weeks later for additional surgery for recurrent RD in the same eye secondary to proliferative vitreoretinopathy in association with a giant tear. Panretinal photocoagulation is performed on a patient’s right eye (OD). The same treatment is performed 1 week later OS. A patient’s RD OD is repaired using photocoagulation (CPT code 67105). During the 10-day postoperative period, 67107 Repair of retinal detachment; scleral buckling is performed on the same eye. An anterior chamber tap OS is performed on a patient during the global period of CPT code 67036 PPV to remove a vitreous hemorrhage. CPT code 67108 Repair of RD with vitrectomy is performed OS within the global period of CPT code 67110 Repair of RD pneumatic retinopexy. What modifier(s) should be appended to 67108? The surgeon performed CPT code 67145 Prophylaxis of RD (eg, retinal break, lattice degeneration) without drainage, one or more sessions; photocoagulation due to a tear OS. During the postoperative period, the patient returned with a new unrelated tear requiring surgery. Can a second laser session in the same eye be billed for? Following are a few additional pointers regarding modifiers -51, -53, and -GA to further boost your modifier chops. Modifier -51 Multiple procedures is rarely required by payers. Systems are sophisticated enough to recognize multiple procedures performed during the same surgical session. Modifier -53 Discontinued procedure or service. When a surgery is discontinued for any reason, payers will require an operative report to determine how much of the surgery has been completed in order to determine proper payment. There is no global period on discontinued surgeries. Modifier -GA indicates to Medicare Part B that an Advance Beneficiary Notice is on file. The Advance Beneficiary Notice is appropriate to use when it is not clear, either by frequency or by diagnosis, that the test, injection, or surgery is covered. Modifier -GA should not be appended to all intravitreal injection claim submissions. To determine what is a covered benefit with regard to use of anti-VEGF drugs, visit aao.org/lcds to review relevant local coverage determinations. Note: The eye modifier should always be listed last when multiple modifiers are required. 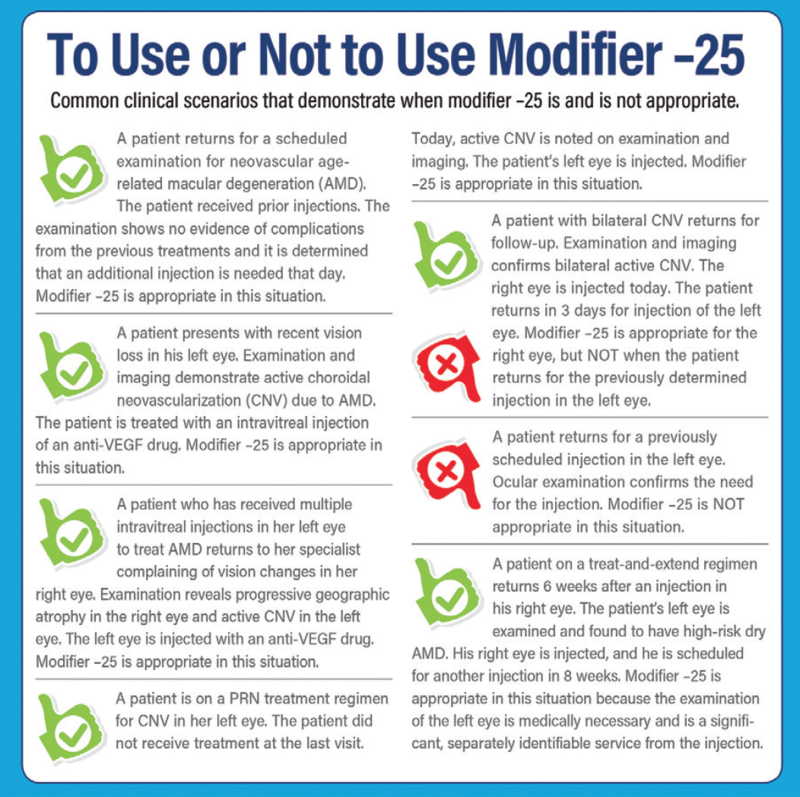 Need a refresher on the use of modifier -25? 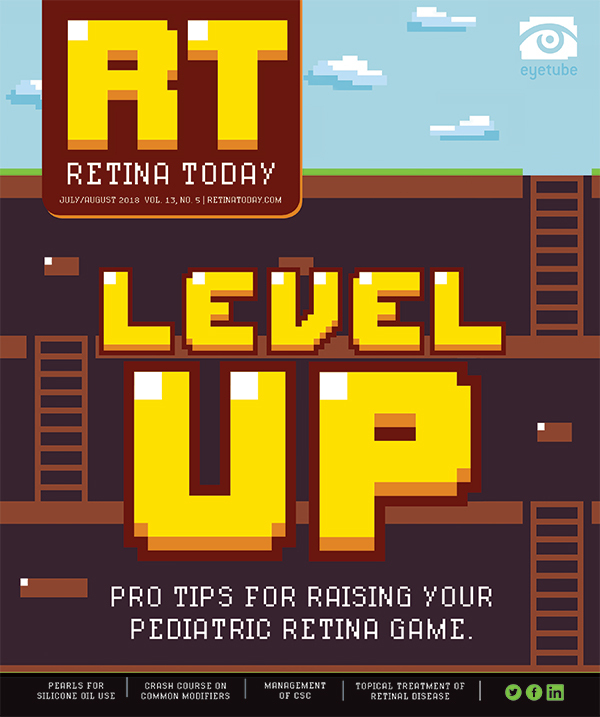 Check out this previous Retina Today article by George A. Williams, MD here.